Info: 2 Bedroom, 2 Bathroom beachfront Edgewater condo, 1,200+/- s.f. 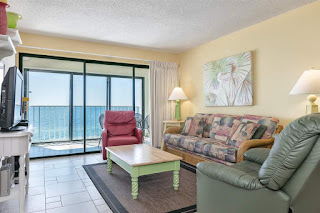 Gulf Shores beachfront condo for sale at Edgewater. Exquisite well furnished two bedroom, two bath Gulf front condo in a highly desirable low density complex! Enjoy the large spacious floor plan with upgrades in bathrooms and kitchen! Great investment opportunity with low HOA dues. Excellent location near the Heart of Gulf Shores! Enjoy close proximity to top area attractions,shopping, and restaurants...come see this incredible condo today. Situated on the white-sand beaches of the Gulf of Mexico, Gulf Shores is a popular resort community on the Alabama Gulf Coast boasting semitropical weather, Gulf Shores lies in the southern subtropical area of North America, where mild temperatures greet visitors year-round. Gulf breezes temper the typically hot summer weather, and spring and fall days are warm with cool evenings. The Alabama Gulf Coast has approximately 317 days of sunshine each year, providing visitors and residents more than enough time to enjoy the beautiful white-sand beaches the area is famous for.